Create your own sightseeing itinerary with this 24-hour New York City Hop-On Hop-Off Tour! 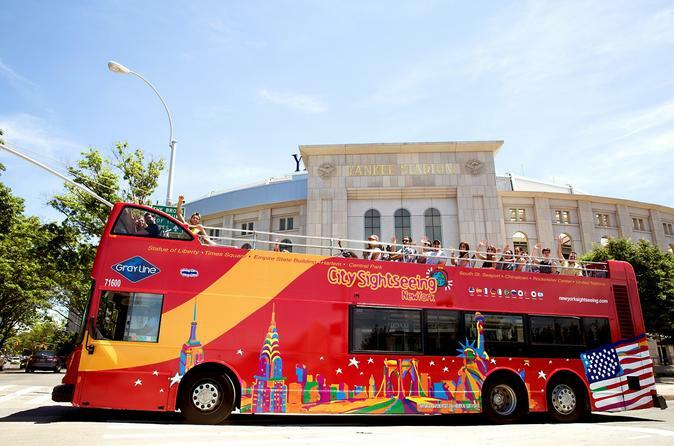 A hop-on-hop-off bus tour is the ideal way to explore every corner of the Big Apple and, with lively tour guides to keep you entertained and informed, you are sure to learn facts old and new about the city that never sleeps! If you're under a time crunch, this hop-on hop-off experience is the best way to explore an individual neighborhood in NYC. A must-have tour for any visitor to the Big Apple! Focus on a specific NYC area and choose between the Downtown, Uptown, or Brooklyn loop. The narration is enhanced with music and sounds of the bustling New York city streets. Additionally, it is GPS-triggered so what you hear will always be relevant to what you see. You'll have unlimited access to the loop of your choice for 24-hours. Can't decide on which loop to choose? Upgrade to the 48-hour or 72-hour All Loops Tour that includes all 3 Loops, Double Decker Bus Night Tour, Hop-on Hop-off Cruise, entrance to Museum of The City of New York or New York Historical Museum and a discount card! This tour is NOT a hop-on hop-off tour. You’ll see more than 20 illuminated city sights and neighborhoods, including Little Italy, Chinatown, SoHo, Greenwich Village, the Empire State Building, Times Square and Central Park. During the holiday season, the Night Tour is replaced with the Holiday Lights Tour, which focuses on Midtown to show you New York City’s legendary department store windows and other Christmas-themed decorations.